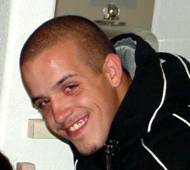 Our nephew, Russell Cage, 20, was shot to death in Bloomfield, New Mexico, at about 3 a.m., January 28, 2003. The Bloomfield Police Department immediately closed the case as a suicide without even viewing a copy of the autopsy report. Cop Story: Earlier that evening, Russell had an argument with his girlfriend, Sylvia Anaya. At 2 a.m. he went to Sylvia’s trailer home to apologize and they spent a pleasant hour together in Sylvia’s bedroom. She invited him to stay the night, but he declined. Almost immediately after leaving, Russell rapped on Sylvia’s window. When she looked out, he was standing, facing her, with a gun in his hand. Without saying a word, he placed the gun to the side of his head and pulled the trigger. (In a second version of this story, Sylvia quotes him as saying, “You think I’m kidding” before firing.) The gun misfired and Russell tried again. The bullet entered the right side of Russell’s head and exited the left side. Then it made an 86 degree turn, traveled through the wall of the trailer, struck the headboard of Sylvia’s bed and fell to the carpet. We find that story difficult to believe, especially since Russell stood 5’10” and the autopsy report says the wound track of the bullet was upwards. Yet the hole in the wall of the trailer is about 4’ from the ground. There was never any indication that Russell was suicidal. He was a healthy, active kid who loved sports and was always making jokes and having fun. We’re a close-knit family, and never once did any of us hear him mention suicide. In fact he was eagerly making plans for his future. He’d dropped out of school at sixteen and started getting into fights and smoking pot, but four months ago he’d made a conscious decision to turn his life around. He’d stopped smoking and was planning to go back to school and then join the Air Force. The toxicology report showed no drugs in his system. On the night of his death, Russell spent the evening visiting with his uncle and a nephew, playing on the computer, and squabbling on the phone with his girlfriend. Russell and Sylvia had been going together for two years and frequently squabbled, but they always made up and were even talking about marriage. Russell’s one main concern about Sylvia was her older brother, Isaac Anaya, who was linked to the East Side Brown Pride Gang. Russell had told several people that certain members of that gang were involved in the beating and shooting death of a man named Dominic Martinez. Russell even claimed that the weapons had been hidden in Sylvia’s trailer home. When friends asked him if he wasn’t worried about being around such people, he said, “If they mess with me, I'll turn them in." Three weeks prior to his death, Russell got into a fight at a local club with a Brown Pride member who threatened to kill Russell. The police don’t want that information. Reportedly one of the members of the Brown Pride Gang has brothers at both the Bloomfield Police Department and the San Juan Sheriff’s Department. On Jan. 28, at about 3 a.m., Russell’s mother, Rhonda Cage, was wakened by an anonymous phone call. A male voice said, “Is this Russell’s mother? I hate to inform you but your son just shot himself.” Click. The caller hung up. The caller was not a police officer. The police never did inform Russell’s mother of the shooting. Nor have they ever interviewed any member of our family. They say they got all the information they need from Sylvia’s family. Rhonda and other family members rushed to the emergency room, and at 3:50 a.m. were informed that Russell was dead. The only person allowed to view his body was Rhonda, who was permitted in the room for only a moment. But that was long enough for her to get a look at his wounds. Rhonda told us the wound in Russell’s right temple was the size of a quarter and the wound on the left side was the size of a dime. As an experienced hunter, I know that an entrance wound is almost always smaller than an exit wound. If Russell, being right handed, had committed suicide, he would have shot himself on the right side of his head. Yet, the smaller wound was on the left side. That’s when we started to suspect that something was wrong. At my suggestion, Rhonda acquired copies of the police report, the evidence pictures and the 911 tape. 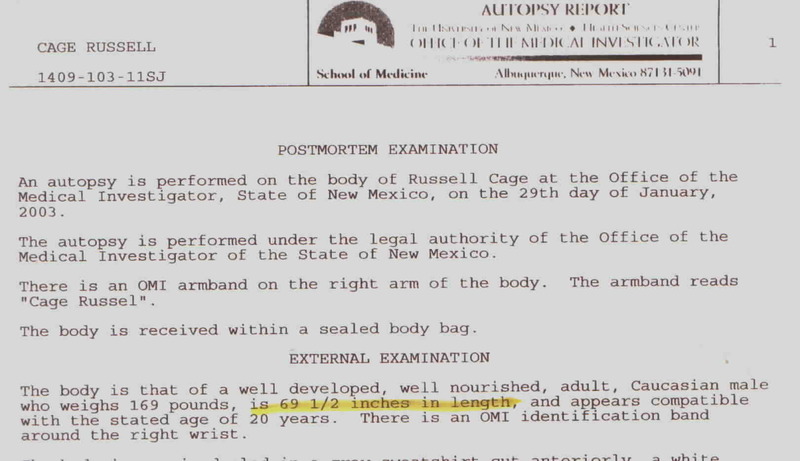 She also got the autopsy report from the OMI. Once we studied those documents, we submitted a long list of questions to the lead investigator, Det. David Whitaker. He refused to answer a single one of them. When Rhonda cited the size of the wounds, as stated in the autopsy report, (the right side wound was 3/8 x 1/8 inches and the left side wound was 0.25 inches), Whitaker demanded to know how we’d gotten a copy of the autopsy report when he didn’t have one himself. We couldn’t believe what we were hearing! How could a detective close a case as a suicide before he received a copy of the autopsy report? Rhonda went on to inquire how either of the wounds could be considered a “contact wound” when the autopsy report stated there were no stippling or burns. Whitaker’s reply was, “The medical examiner is wrong. I’ve ruled this a suicide and that’s that.” We hadn’t even gotten home yet when Sylvia contacted Russell’s sister and demanded to know, “Why does your family think Russell didn’t do this to himself and that Isaac or I had something to do with it?” Apparently Det. Whitaker had contacted Sylvia as soon as we left his office and given her a run-down on everything we said to him. Our family suspects that Russell was shot inside the trailer, probably in Sylvia’s bedroom, (her family immediately cleaned the carpet and repainted the walls). Sylvia’s younger brother, who was in the trailer at the time, has told people that Russell was shot inside the trailer and the bullet then hit a teddy bear and blew it apart. Sylvia’s mother also indicated to police that Russell was inside the trailer when he was shot. 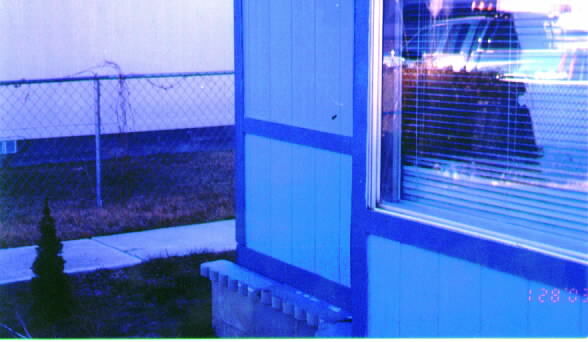 Evidence suggests that Russell was then dragged out of the trailer, spilling blood along the way, and positioned in the yard in front of Sylvia’s window. But his killers made a few mistakes. They didn’t get him into the right position to mesh with the blood pattern on his head. And the gun got placed behind his legs instead of in or near his right hand. But is that gun the same gun that's in the evidence room? According to police reports, the gun that was found at the scene and checked into evidence had the serial #1010376. The following day, a different police officer went to the evidence room to get the serial number to run through NCIC. This time the gun had the serial #TZD6586. 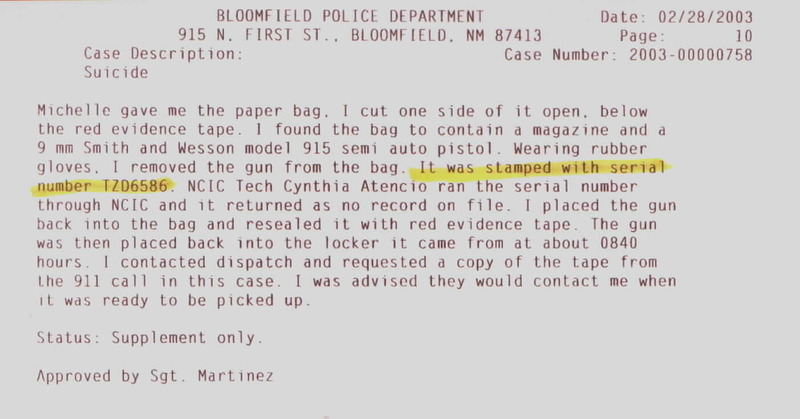 Assuming an honest mistake had been made and #1010376 was actually a parts number, three members of our family, accompanied by an attorney, visited the evidence room and inspected the gun. There was only one number on the gun, #TZD6586. No parts numbers. Nothing to confuse the issue. A second gun was apparently substituted for the weapon found at the scene. How could this happen, and why? · Why does the gun in the evidence room have a different serial number from the gun that was checked into evidence? · Which, if either of the guns was Russell shot with? · Why are there no pictures of Russell at the scene? · Why are there no pictures of the gun? · Why were no ballistics done on the gun? · Why wasn’t the gun tested for prints? · Why was the bullet that was found on the floor of Sylvia’s bedroom not checked for blood or DNA to confirm that it was the bullet that killed Russell? The fact that it passed through the wall of the trailer at a point two feet lower than Russell’s head suggests that it may not be the same bullet. · If Russell committed suicide and fired the gun with his right hand, why was gunpowder found on both his right and left hands? · Who else was in the trailer besides Sylvia and her family? Other voices can be heard on the 911 tape, and Sylvia herself has told us that Russell climbed out her bedroom window to avoid her brother’s friends who were in the next room. Yet police reports state that the only people in the trailer that night were Sylvia; Adam Anaya (Sylvia’s 16-year-old brother); Priscilla Anaya (Sylvia’s mother); and Ross Arellano (Priscilla’s live-in boyfriend). · The anonymous call to inform Russell’s mother that Russell “shot himself” was made at about 3 a.m. The 911 call to police was made half an hour later. What other calls were made from that trailer before Sylvia got around to calling 911? If, after a thorough and honest investigation by an outside agency, evidence indicates that Russell did commit suicide, we will have to accept that. But if it was something else, then Russell -- a 20-year-old man with his whole life ahead of him -- and the family and friends who loved him deserve justice. At the very least we deserve to have our questions answered.